Our home for a year, a 39 foot long, 350 hp diesel pusher with three slideouts that transform the vehicle into a comfortable apartment. Both the dinette and the Easy Rest sofa convert to beds on the driver's side of the vehicle. A jack-knife couch on the passenger side also converts to another bed. This photo shows the Dinette after it has been converted into a bed in seconds. 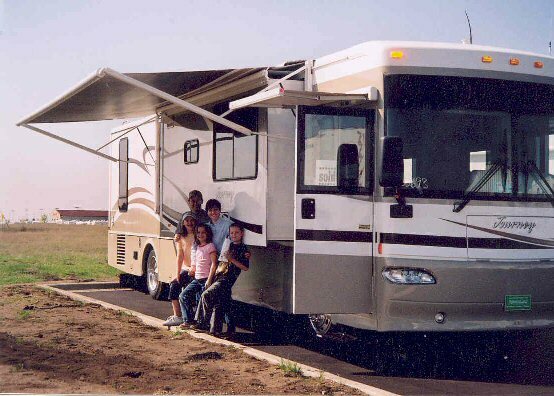 The passenger slideout moves the jack-knife couch and the whole kitchen to open up the floorplan into a comfortable family room with adjoining kitchen. An engineer's dream, the major house controls are all centrally located on a panel by the kitchen! Harvey provides us with a full-sized shower across from the lavatory in a room that can be isolated from either direction between the master bedroom and the main living area. There is ample cabinetry and storage in the lavatory. They even include a standard china toilet. Below the TV, there is even a washer dryer combo for keeping up with the essentials while on the road!